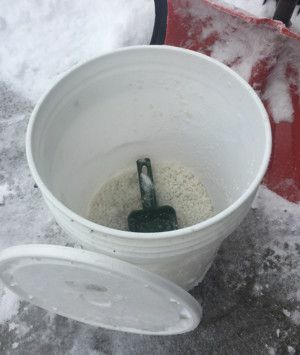 Store ice melters in plastic tubs with lids to be sure that they stay in good shape for you to use this year and each year their after. I would highly recommend purchasing one of our all purpose 5 gallon tubs with lids from our Paint Department. These tubs have lots of uses, but I have still not found a better option for storing ice melters. The removable lid allows for easy access to the salt inside, even when covered in fresh snow or ice. The included handle allows for easy maneuvering around the house, especially with winter gloves on! One tub will hold about 40 pounds of your favorite ice melter. Best of all, these tubs with lids only cost about 6 bucks!